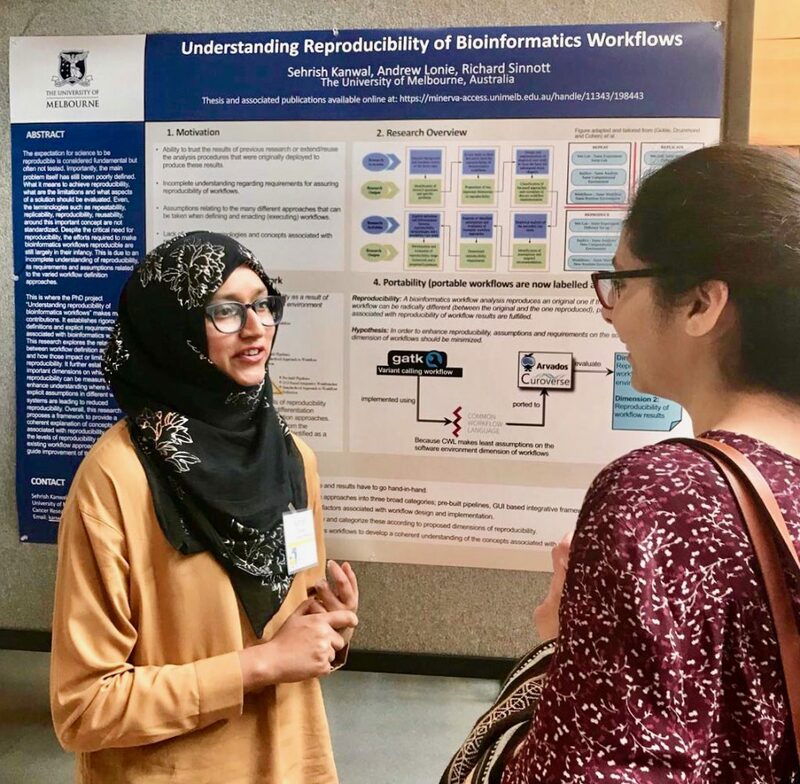 This year, the Galaxy Community Conference (GCC) and the Bioinformatics Community Conference (BOSC) met together to form the first Bioinformatics Community Conference. 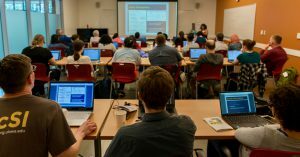 At GCCBOSC 2018, participants were able to meet and collaborate with a broad community of bioinformatics developers and users who focus on open, interoperable software tools and libraries that facilitate scientific research. 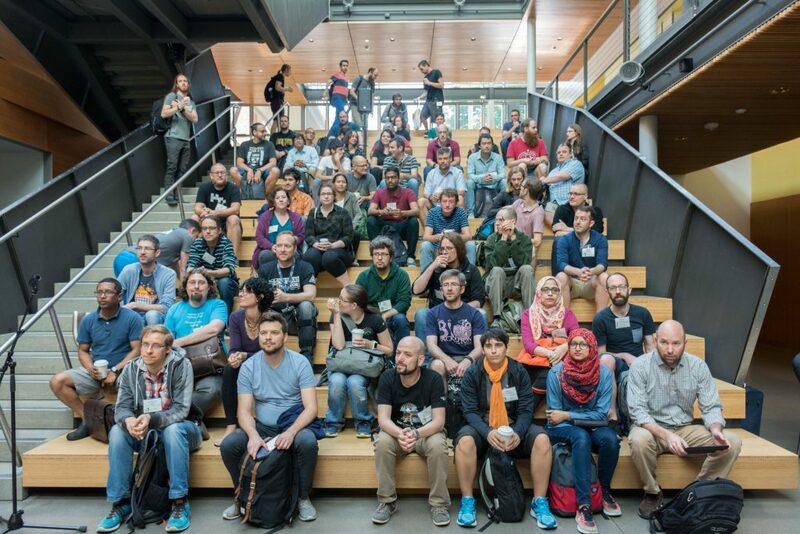 Held in June 2018 at Reed College in Portland, Oregon, GCCBOSC attracted nearly 300 participants from around the world. The meeting started with two days of training workshops (Figure 1). The main meeting had some parallel sessions and some joint sessions, including well-received keynote talks by Tracy Teal, Fernando Pérez and Lucia Peixoto, as well as a panel discussion about documentation and training. Posters, demos and Birds of a Feather sessions (BoFs) gave participants opportunities to engage in discussions about topics of mutual interest. After the main meeting, many attendees stayed for up to four additional collaboration days (the CollaborationFest, or CoFest). Figures 2,3. Attendees and presenters mingled at the poster/demo sessions. Figure 4. CoFest attendees assembled for morning meetings before breaking into smaller groups to work on collaborative projects. There was wide agreement among GCCBOSC participants that the meeting was informative, productive and enjoyable. Comments from participants in the post-meeting survey included, “Loved the mix of communities!”, “Location was great,” and “Nice conference. Nice atmosphere. Nice people. I really enjoyed it. Thanks!”. The training workshops and extended CoFest were mentioned by participants as great features of the meeting. 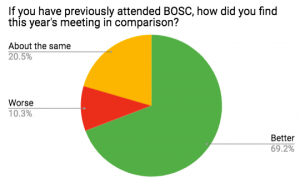 Most of the survey respondents who had previously attended a GCC or BOSC rated this year’s meeting as similar or better than past meetings (Figure 5). 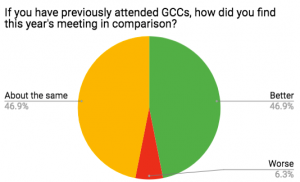 The main complaint was that the parallel GCC and BOSC sessions forced attendees to choose between them–an embarrassment of riches. Figure 5: Responses to post-GCCBOSC survey questions from those who had been to previous GCCs or previous BOSCs. Although post-meeting feedback was almost entirely positive, we did receive two reports of behavior at GCCBOSC that the reporter perceived as not consistent with the spirit of the Code of Conduct. These were handled by the GCCBOSC organizing committee, and everyone involved is satisfied with the outcome. The discussions held by the organizers around these issues led us to re-examine the CoC and think about how we might want to revise it for future meetings. Your input on this topic (or anything regarding GCCBOSC) is welcome. We are grateful to all those who helped make GCCBOSC 2018 a success: the organizers, presenters, workshop leaders, participants, and our generous sponsors, including Platinum sponsor Google Cloud and Gold sponsor Lenovo + Intel. Thanks in part to sponsor funding, we were able to offer subsidized child care and an onsite lactation room that enabled a speaker who would otherwise have been unable to attend to bring her four-month-old baby and participate actively in the meeting. Whether or not you attended GCCBOSC 2018, we look forward to interacting with you in the future! This entry was posted in BOSC/ISMB, Community, Uncategorized and tagged BOSC, Community, conferences, GCCBOSC. Bookmark the permalink.